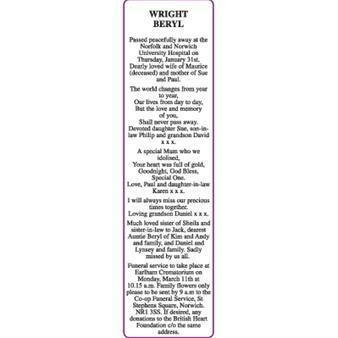 WRIGHT BERYL Passed peacefully away at the Norfolk and Norwich University Hospital on Thursday, January 31st. Dearly loved wife of Maurice (deceased) and mother of Sue and Paul. The world changes from year to year, Our lives from day to day, But the love and memory of you, Shall never pass away. Devoted daughter Sue, son-in-law Philip and grandson David x x x. A special Mum who we idolised, Your heart was full of gold, Goodnight, God Bless, Special One. Love, Paul and daughter-in-law Karen x x x. I will always miss our precious times together. Loving grandson Daniel x x x. 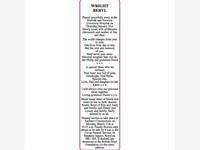 Much loved sister of Sheila and sister-in-law to Jack, dearest Auntie Beryl of Kim and Andy and family, and Daniel and Lynsey and family. Sadly missed by us all. Funeral service to take place at Earlham Crematorium on Monday, March 11th at 10.15 a.m. Family flowers only please to be sent by 9 a.m to the Co-op Funeral Service, St Stephens Square, Norwich. NR1 3SS. If desired, any donations to the British Heart Foundation c/o the same address.